Usnea herb is very powerful. While I tend to not use the prefix ‘anti’ to describe how herbs work, this is one herb that can really be summed up with this prefix. Usnea is anti-bacterial, anti-viral, and anti-fungal, making it a premier choice for all sorts of infections and wounds. This article will take a closer look at how this herb can be used for infections and wound healing. It’s difficult for us to know how this particular herb was used in European history. Before a certain time period all lichens were referred to as the same herb, so it’s hard to distinguish how usnea in particular was used. But it undoubtedly was! In Chinese Medicine several types of Usnea were used. The specific indications were for infections with signs of heat and dampness: redness, yellow pus, fast pulse, etc. Today Usnea is used for infections of all types even without indications of heat. When a person takes a pharmaceutical antibiotic, it attempts to kill all bacteria, especially the bacteria found in the digestive tract. However, we are learning more and more that this plethora of bacteria is actually incredibly beneficial to our health. Usnea is an anti-microbial herb, meaning that it effects a wide range of pathogens. It, however, is not an antibiotic herb that kills all types of bacteria. This is actually a positive trait for humans. Because it effects mainly gram positive bacteria, it can effectively kill unwanted pathogens without majorly disrupting healthy gut flora! Usnea is also used for strep throat, tuberculosis, pneumonia, upper respiratory tract infections, urinary tract infections, and diarrhea. I did find one reference that it has been shown to be effective against Helicobacter pylori (which is gram negative). This can make it a useful part of a larger protocol for gastric ulcers. Do you know the difference between a virus and a bacteria? A bacteria is a (relatively) large unicellular organism. A virus is a microscopic particle that invades living cells. Bacteria can be relatively easy to kill but viruses are a different matter. When a person has a virus infection, the virus exists within the person’s cells. To kill the virus can mean killing your own cells. This can be very problematic. Nevertheless, we have amazing herbs that are effective against viruses and usnea herb is one of them. It has been shown to be effective against common viral infections such as herpes simplex and Epstein Barr. Continuing with our exploration of usnea as an antimicrobial herb, we can add antifungal to the list. Usnea herb is effective at killing many types of fungal infections, including Candida species. It can be taken internally as well as used topically. 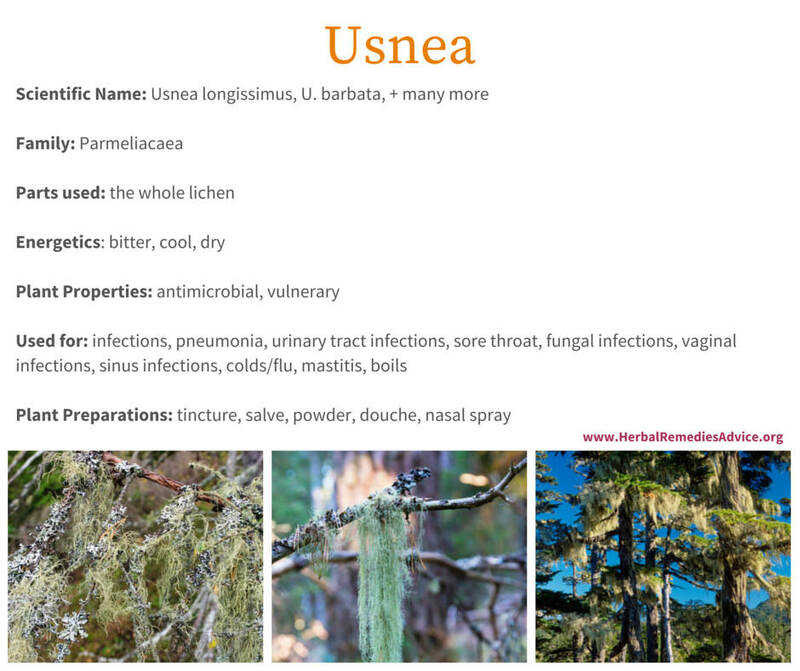 Here are some examples of fungal infections that you may use usnea herb for: athlete’s foot, jock itch, dandruff, ringworm, vaginal infections, etc. It is probably worth noting that fungal infections can be especially difficult to get rid of. 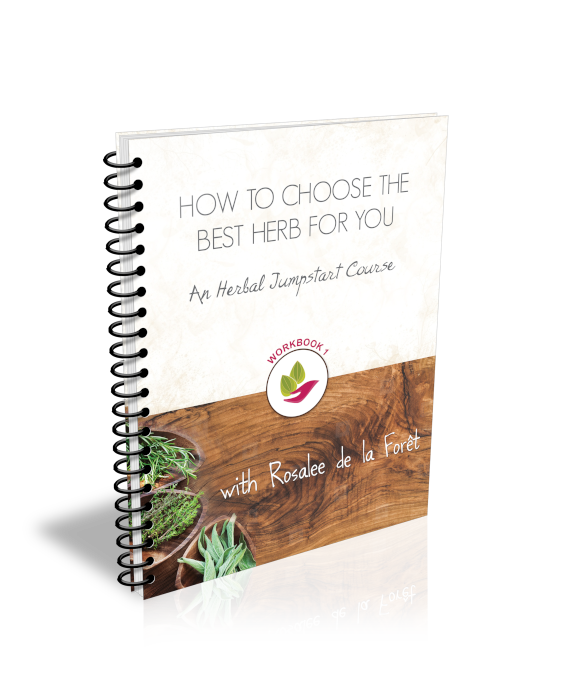 Generally diet and other lifestyle consideration will also have to be taken into effect and other herbs may be needed for extensive periods of time to fully resolve the issue. Usnea is a fantastic choice for wounds. As we’ve seen, it is a powerful antimicrobial herb. Using usnea herb in wounds can help treat or prevent infection. It also has wound-healing abilities that can quicken the healing process. To use usnea on a wound you might try it as a powdered herb or, if the wound is not infected, as a salve. According to Steven Buhner, usnea is synergistic with clarithromycin, which can increase its effectiveness. Usnea should not be used in pregnancy. You may see warnings about usnea toxicity, especially in relationship to being toxic for the liver. The basis of these claims comes from studies using isolated usnic acid, not from using the whole plant. Usnea is not particularly water soluble. Many herbalists also claim that in order to get a good alcohol extraction heat needs to be applied. Of course heat and alcohol can be a volatile combination. I’ve heard of many interesting ways to make a heated alcohol extraction of usnea herb, from putting the macerated tincture through a dishwashing cycle, to heating it in the crockpot, to using a pressure cooker. Try those at your own risk! Use a tincture ratio of 1:5. The liquid should be composed of half water and half pure grain alcohol. So if you have 5 ounces of herb, you will use 25 ounces of liquid - 12.5 of water, 12.5 of alcohol. Put the powdered herb in the slow cooker, add the 12.5 ounces of water, and stir well. It will turn into a kind of mush. Cover and then cook on low heat for 48 hours. Let cool enough to work with it without burning yourself, then pour into a heat-tolerant jar (Mason or equivalent), add the alcohol when the mix is still warm but not hot, and then put on the lid and shake well. Let macerate for 2 weeks, then decant and strain out the herb. Bottle and store out of the light. The tincture dosage of usnea will vary depending on the reason for use, person’s weight, sensitivity to herbs, etc. 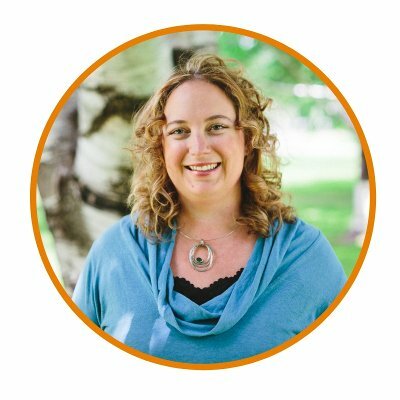 Ranges may be from 60 drops 3-4 times daily to 1 tsp up to six times daily. Usnea herb also works well as a salve. First powder the herb well. Infuse the usnea powder into oil using the hot method. Once the oil is made it can be prepared into a standard salve. For increased antimicrobial capabilities consider adding Oregon grape herb and/or red cedar (Thuja plicata) needles to the mix. Usnea is commonly used for vaginal infections. It can be used as a douche by diluting the tincture in water. While usnea is certainly an herb, it’s not a plant! Usnea is a lichen, which is a symbiotic relationship between an algae and a fungus. There are over 600 species of usnea lichen that grow across the world and many of these species are used interchangeably. 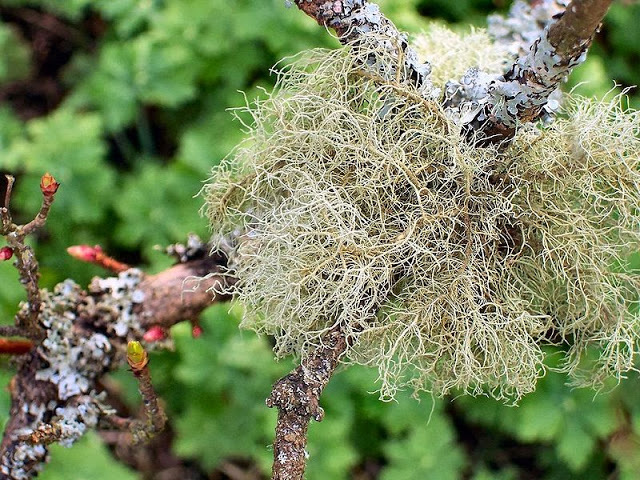 The best way to identify an usnea plant is by taking a moistened strand and gently pulling it apart. 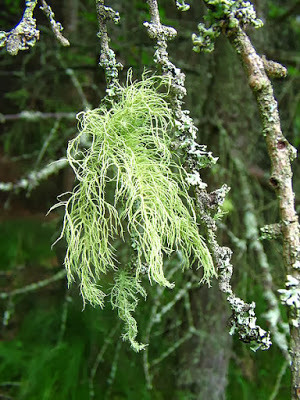 If it is usnea you’ll see an inner white strand that is very elastic. This inner white strand is the fungus while the green outer covering is the algae. Usnea grows on trees. It especially likes pine, spruce, juniper, firs and hardwoods like oak, hickory, walnut, apple and pear. It prefers moist habitats. Usnea is a ubiquitous herb that grows all over the Northern hemisphere. However, it is a very slow growing lichen that could be easily over-harvested. The best way to ensure sustainable harvesting practices is to gather usnea after a windstorm from freshly fallen branches. Another consideration for harvesting usnea is that it can absorb heavy metals so it is especially important to gather it in a clean location. 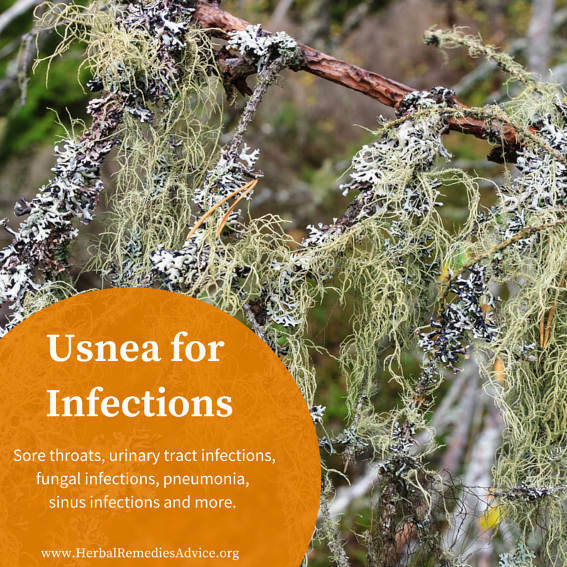 Usnea is a powerful herb to use for a variety of infections, from topical infections such as fungal infections or staph infections to internal infections like strep and urinary tract infections. Because it is useful in so many different situations it is well worth having around!